You can adapt any environment to your baby or toddler’s need of independence with few materials and costs. We did this when we changed homes very often and traveled a lot. When we settled down in a home I wanted to take advantage of this opportunity and design the space as a Montessori home for our daughter, so that she can have access to each space we use and encourage her to do many things by herself. My favorite space! :) We love books in our home and naturally my daughter is also passionate about it. We have two reading spaces for her: one in our office (that she mostly uses during the daytime) and another one in her room (with books for bedtime stories and also some of her favorite books). At the moment she loves hearing us reading (as she is learning many new words) so she starts her day with a story. She wakes up, grabs a book and asks us to read it yo her. She has her favorite books and she likes to her them over and over again. In our office she has 2 rows on the bottom a bookshelf. 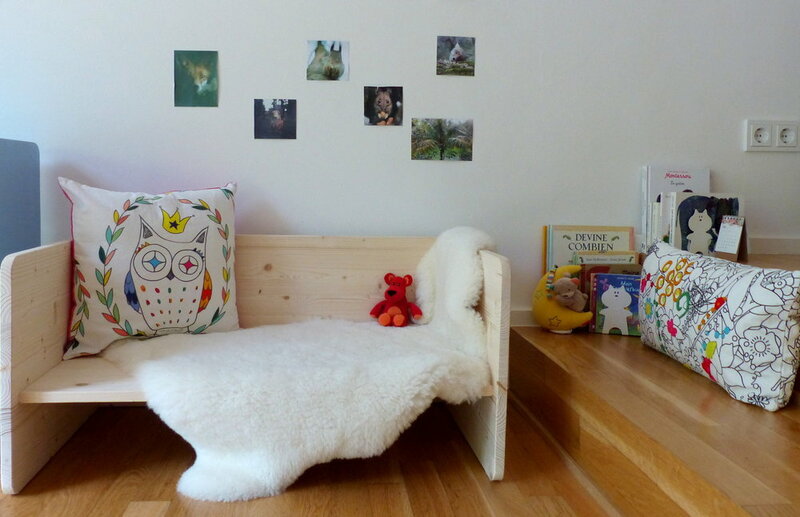 In her room we have installed a reading bench at her size made by Woomo. Her books are just near by. I rotate them to create a "novelty effect"
Music has always been with her. When she was 3 months old we started attending Music Together workshops and Montessori music activities in Beijing. We also found some amazing music workshops in Seoul. She loves music. At 10 months she was dancing in the rhythm of the drums. So I have set up a music corner for her with a CD player, some CDs and instruments. Amongst the CDs we have those from our Music Together classes but also our CDs. Since we listen to them in a continuous loop through the day it was important to choose the music we all love. I like the music instruments made of wood in Germany by Corvus and by Goldon and this big drum made in Taiwan by Remo. All the toys and materials are stored and displayed on small trays, baskets or wooden plates. "Every thing is in its place, and there is a place for every thing." as Maria Montessori established it in her Children's House. It makes it much easier to clean up, less things to buy and if you rotate toys and activities, you create a "novelty effect" (like for books). We have a bigger closet with all the spare books, toys, materials and clothes. On the shelves I put only what she uses at the moment. One of her favorite exploration field is the garden where we observe the bees and the snails and where we put nuts and hazelnuts for the squirrels. We have a high table and a low table (Japanese style). Sometimes she climbs on her high chair so that we can share our meals as a family at the big table and sometimes we sit down on the floor and eat at the low table so that she can have more freedom of movement. She just stands up at this low table or asks us to bring her little armchair. I think it’s fare and respectful to have these 2 options and not just the big table for the "grown ups". She can independently come to the table and leave it in both situations. During a phase where she tended to run through the house with food in her hands we had to set clear boundaries about where we can eat and when. In the kitchen there is also a small table for her where she can pour herself a drink and have her snacks. 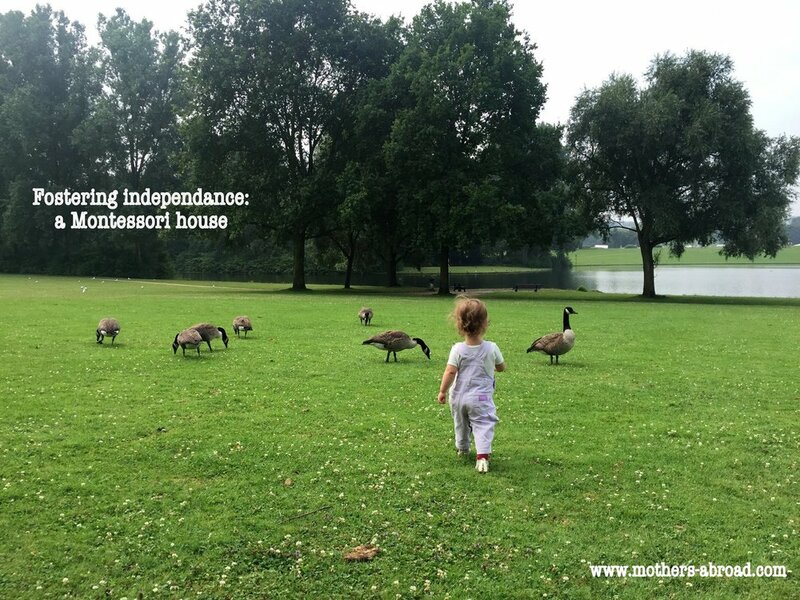 I believe one of the most important things in the Montessori philosophy is to help children do things by themselves and this has its most importance when it comes to self-care. Children as little as 13 months old can wash hands with little help from the care giver and an 18 months old can actively participate to dressing up. It is empowering for a little person to be able to take care of herself. To enable it we need to adapt the environment a bit (and summon our patience). A stepladder to reach the bathroom sink is very helpful. We have one from Ikea but it can also be done by a DIY enthusiast. On the sink: a little soap and a small towel. In her room we have this beautiful and practical handwashing station from Woomo where we have stored hair brush, a comb, a small toothbrush and toothpaste. We have also this wonderful book about a little boy named Jonas who brushes his teethes every night and this has saved us a lot of battles to brush the teethes, which was not very Montessori to be honest and unpleasant for her and for us. In her room we have a little wardrobe and she can access all her clothes although she does not dress up independently yet. Maybe you are wondering if the wardrobe is always so orderly. It is not! She likes to spend time "trying out clothes" which is actually a way of practicing her skills to dress up independently. Her bed is an opened bed. She can get in and out independently. But it is very often empty as we do the bedsharing (co-sleeping) since she was born. If I had to choose one piece of furniture that really had an impact on our daily life is the Learning Tower. Before we had it, we needed to cook with our daughter in one hand as she always wanted to see what's going on in the kitchen. It was exhausting and dangerous. Now she is really happy as she can climb on the Tower and then climb down all by herself. It is secured and also a nice piece of furniture that we enjoy having in our kitchen. She can now help in the kitchen and also have a snack on the counter while we are cooking. I hope you enjoyed our guided tour. I am so grateful that we finally settled down and that we were able to set up the home for our daughter in a way that obviously makes a huge difference for her. She has gained so much autonomy in her every day life. To be truly honest, having a Montessori set-up is not always an immediate gain of time. You will need to clean much more when your child is doing some things by herself (like washing hands or trying out clothes or "helping" in the kitchen), you will need more patience and creativity but in the end it really worths your energy and time. Being able to do things by themselves makes a huge difference for children (for their development and self-esteem) and in the end, when they become completely autonomous at a very young age you will be able to lean back and enjoy. I'm not there yet but I trust it. Note: In this article I have included links and brand names as I have always found it helpful on other Montessori blogs. I was happy to find out where I can buy some of the things I needed. I don't have any link with the brands quoted here other than being a satisfied customer.